Where am I? 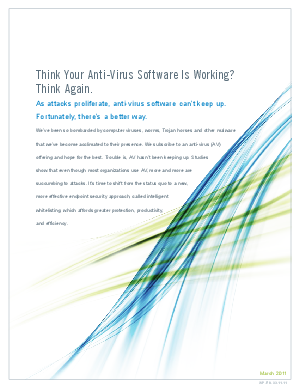 › Home > White Papers > Lumension > Think Your Anti-Virus Software Is Working? Think Again. As volume and sophistication of malware has dramatically increased, anti-virus (AV) has not been able to keep up. AV is built upon a “blacklisting” approach where the notion is to let all traffic in and then, hopefully identify and remedy whatever your AV provider has been able to define as being “bad”. A more effective and efficient way is to let in only the applications you’ve approved, and block everything else - a process known as application control, or “whitelisting”. Application whitelisting is a mature, proven security strategy that traditionally has not provided the flexibility to accept much change, such as constantly updating applications, frequent patch updates, etc. However, innovations in application whitelisting now make it a more effective and efficient security approach, in even the most dynamic and complex endpoint environments. Before simply renewing your anti-virus subscription, think again.